Non-eugenol, dual-cure luting composite for the esthetic temporary cementation of provisional crowns, bridges, inlays, onlays and veneers. Contains: 2 x 6g dual syringes, 10 mixing tips. 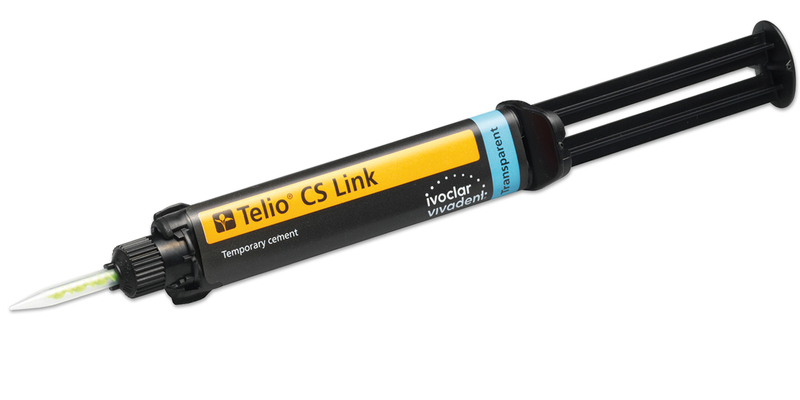 Telio CS Link earned 4.3 stars out of a possible 5.0. Medium translucency, which means it won't shine-through provisionals but it can also moderately mask a dark prep. Adequate working time for multiple units and is very easy to clean off preps. Although its prime indication is short-term provisional cementation (less than four weeks), we have used it with provisionals cemented several months without any problems whatsoever. Viscosity allows full seating of restorations without rebound. It has no effect on bond strength. Not enough retention for partial coverage restorations. Can leak at margins if curing protocol is not followed. One evaluator thought it did not adhere as well to acrylic provisionals compared to those fabricated from composite. Ease of use and semi-opaque property makes this the cement of choice for anterior provisionals.